By Michael Kuser and Rich Heidorn Jr. 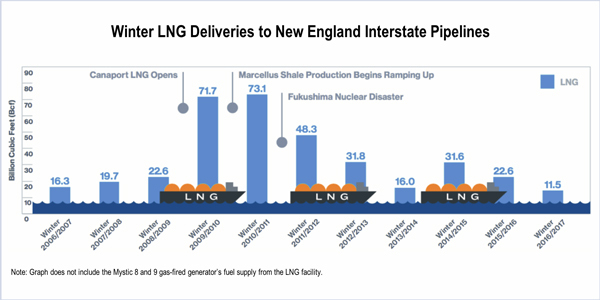 The New England Power Pool Markets Committee on Tuesday debated ISO-NE’s proposals for conducting fuel security reliability reviews and allocating the costs of resources retained as a result. 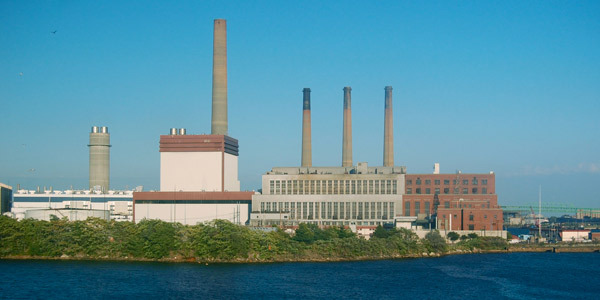 The fuel security issue became a pressing matter following a July 2 FERC ruling that called the RTO’s request to waive several Tariff provisions “an inappropriate vehicle” for keeping the Mystic Generating Station running (ER18-1509). Exelon plans to retire the 2,274-MW plant when its capacity obligations expire in May 2022. FERC’s July 2 show cause order set an Aug. 31 deadline for ISO-NE to submit interim Tariff revisions for filing a short-term, cost-of-service agreement to address fuel security concerns and a July 1, 2019, deadline for filing long-term Tariff revisions. ISO-NE said it plans to review retirement de-list bids and Substitution Auction demand bids and may reject either type of bid for fuel security or reliability reasons. The RTO will notify market participants with retirement de-list bids that are needed for fuel security at the same time they receive the retirement determination notification from the Internal Market Monitor. The RTO also said it may reject a reconfiguration auction demand bid if the resource has been identified as a fuel security resource in an FCA. It is proposing a “status quo” approach for Forward Capacity Auction 13, by which resources retained for fuel-security reliability will be entered as price takers, the same approach applied to resources retained for transmission reliability. “FERC has found such treatment just and reasonable in that context; fuel security is another reliability retention,” the RTO said in a presentation. It said it will work with stakeholders to develop alternatives to the status quo for FCA 14 and FCA 15. Brett Kruse, Calpine’s vice president for governmental and regulatory affairs, told RTO Insider his company and other generation owners are concerned that pricing the Mystic units at zero in FCAs 13, 14 and 15 will suppress prices, fears they expressed in protests in the docket. Kruse noted that FERC’s order rejecting the fuel security waiver outlined ways to treat Mystic’s out-of-market capacity to mitigate price suppression. “Notwithstanding FERC’s clear concern about price suppression, ISO-NE has since told us — and reiterated clearly this week — that they will not consider either of FERC’s suggested approaches, instead reverting back to their original position of putting Mystic in at zero,” Kruse said in an email. ISO-NE proposed to allocate out-of-market costs incurred to retain resources for fuel security regionally based on real-time load obligations (RTLOs). The new Tariff provisions would apply to FCAs 13, 14 and 15. The RTO said it was proposing regional cost allocation based on FERC’s prior ruling on allocating costs of its winter reliability program (ER13-1851). The NEPOOL Reliability and Markets committees will meet separately on Aug. 22 to vote on the proposal ahead of an Aug. 24 review and vote by the Participants Committee. Some stakeholders expressed concern at Tuesday’s Markets Committee meeting that the RTO’s Pay-for-Performance program may not spread the costs for ensuring fuel security equitably. Under the program, launched June 1, costs for performance bonuses are supposed to be funded mostly by penalties on nonperforming resources and not directly by customers. George McCluskey, assistant director for wholesale electric markets at the New Hampshire Public Utilities Commission, told the committee that his agency is concerned PFP will not eliminate fuel security risks because of state emission policies that limit operation of existing dual-fuel units and discourage investment in new dual-fuel capability. “If resources are retained to address unmitigated fuel security risks, the out-of-market costs should be allocated to states whose emissions policies restrict market response to PFP,” McCluskey’s presentation said. ISO-NE has identified Massachusetts and Connecticut as states with emissions policies that restrict market response. New Hampshire disagrees with Connecticut’s inclusion in that list and thinks costs should be allocated to Massachusetts only. The RTO has also suggested that it may rely on reliability-must-run contracts for units needed to meet winter system reliability needs, for both fuel and transmission security, proposing that such units recover costs through regional allocation. The Maine Public Utilities Commission opposes regional cost allocation, saying in a presentation that ISO-NE “offers no reason why it departs from long standing cost-causation principles” and that RMR costs should be assigned to local reliability areas. “Regional allocation of RMR costs for units that are both transmission and fuel-insecure will mask underlying transmission issues,” the PUC said. The commission noted that Mystic Unit 7 was retained for transmission security purposes in FCA 12 and said an analysis of Mystic Units 8 and 9 could reveal a similar need, but that ISO-NE has not conducted a study. If Mystic 8 and 9 are needed for local reliability needs, the PUC said, congestion would occur at the Maine-New Hampshire interface in a fuel security event, meaning load shedding in Maine would not provide fuel relief to southern states and the state’s consumers would not benefit from avoiding load sheds. “Maine, or any other reliability region, should not pay for RMR contracts related to fuel security unless Maine, or any other reliability region, can be seen as a beneficiary of the RMR,” the commission said. Dan Dolan, president of the New England Power Generators Association, told RTO Insider his group strongly opposes ISO-NE’s proposal to apply an out-of-market approach to FCA 15 and potentially FCA 16, calling it an abdication of the grid operator’s market design and price formation responsibility. “We have two fundamental issues: ensuring that this type of an out-of-market approach to fuel security ends as soon as possible and that resources held do not undermine the economic price formation in the Forward Capacity Market,” he said. Calpine, NextEra Energy and Direct Energy are sponsoring an amendment that would allocate costs to network load instead of ISO-NE’s proposed allocation to real-time load obligations. Kruse said he expects support for their amendment from public power and state-represented entities. Kruse noted that ISO-NE is using the transmission security RMRs as precedent for pricing treatment, but not for cost allocation. FERC last week ordered settlement procedures to determine how costs should be allocated for PJM transmission projects of 500 kV or more that were approved before February 2013. SPP’s Regional State Committee approved a process for reviewing new members’ effect on regional cost allocation, but not before rejecting language that stakeholders have been unable to agree on since July.